If you use a computer in China, the chances are that you have to do battle with a virus sooner or later. Official figures quoted by the Xinhua state news agency show that about 85% of computers were infected with a computer virus this year. The main reason for the spread of the viruses was increasing use of the internet and e-mail, said the survey. The internet is hugely popular in China, with more than 68 million internet users as of June. The number of infected computers is based on a two-month survey conducted in the middle of the year by officials of the Ministry of Public Security. The study cited computer viruses as the main threat to China's information network security. It said that most people were not aware of how to protect their machines against viruses or did not use anti-virus software. Instead the malicious programs were spreading as people downloaded files from the internet or opened e-mail attachments. One of the worst viruses to hit the country was the Sobig.F worm. It is estimated to have infected as much as a third of the country's computers in August. 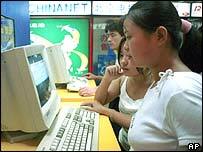 China has one of the fastest growing internet populations of the world. In 1997 just half a million had net access. According to official figures, around 68 million people were online in China by mid-2003, putting the world's most populous nation second behind the United States in terms number of people on the net.